There´s only a shade brighter over the horizon to the east when you are getting settled in the comfortable hide. The heater is spreading pleasant warmth as you start to see the silhouettes of snow-covered pines on the mire outside. The first clicking calls of Ravens can be heard, the camera is set, you are ready. 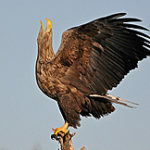 On heavy wingbeats the first Eagle approach to land in one of the dry, old pine trees just in view from the hide. It´s only 20 meters away and you have to move the camera very carefully when you take your first pictures in the dawn´s early light. 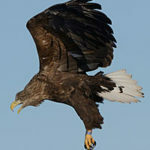 You´ve never been this close to a wild Eagle before. 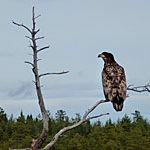 Here in the big Pine forest, Golden-, and White-tailed Eagles are spending the winter and get attracted to our feeding station. 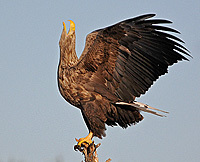 They will come to feed on very close range, down to 20 meters from the hide and you can get amazing photo opportunities of these impressive birds. 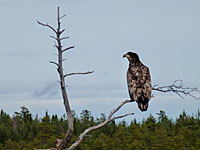 A couple of dry pine trees are posted out in front of the hide for the Eagles to perch on. We bait with prey like fish, Hare, Fox and Deer to get as natural pictures as possible. 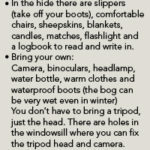 The hide is well insulated, it´s got a heater and a loo and a good panorama view facing north so the light is always from the back side in winter. 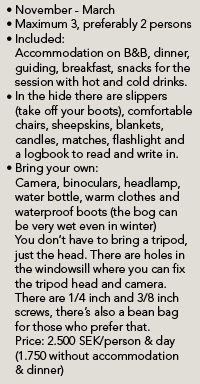 The hide is optimized for two persons but 3 can sit if you´re prepared to be close. You sit on sheep skins on comfortable chairs. 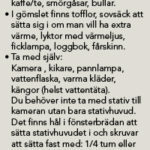 The logbook offer authentic testimonies from previous visitors. 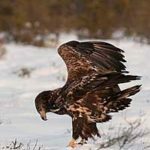 Our Eagle photo hide is situated in the vast, forested Bergslagen area by the Black River Valley, in Västmanland. The forest here is 750 km2 big, without any bigger roads crossing than gravel tracks. Here the risk is small for human disturbance and the wildlife is rich. 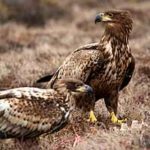 the White-tailed Eagle was near extinct in Sweden and at one point in the 1970:ies there were only 20 pairs left in the whole country. 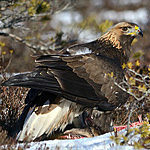 Persecution and toxins where the main cause for the decline. 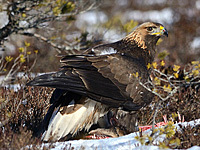 The banning of several chemicals as well as the devoted work of many conservationists, to provide the Eagles with good, healthy, fresh food through the winter has lead to a higher survival rate for young birds, which in turn have lead to the increase of the population and now 530 pairs are breeding in Sweden. 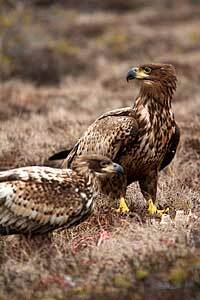 The Golden Eagle also increases in parts of Sweden, (500 pairs are estimated to breed) but is still persecuted in the north. 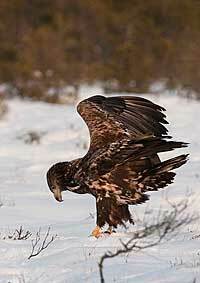 Despite that 90% of the Swedish Golden Eagles breed in the northern part they only produce 65% of the offspring. This is not only due to a harsher climate. The southern populations are increasing and spreading north. 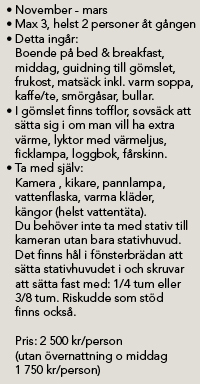 We are still waiting for the first pair to be found in Västmanland though. 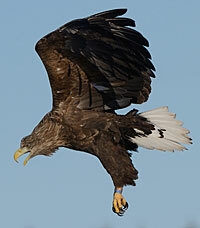 Many of the Eagles wintering in central Sweden come from the north of Sweden and Finland. We know that because we actively identify ringed birds from the hide. If you take pictures of ringed birds, please share them with us so we can report them and also let you know where they come from. Even possible for groups or photo workshops.